Keyword(s) are hard-coded into the system and not customizable. Just give your parents the keyword CHECK. That is literally all they need. CHECK-IN and CHECKIN will work as well. Like our other keywords, upper/lower case doesn't matter. Printer Station Requirement. 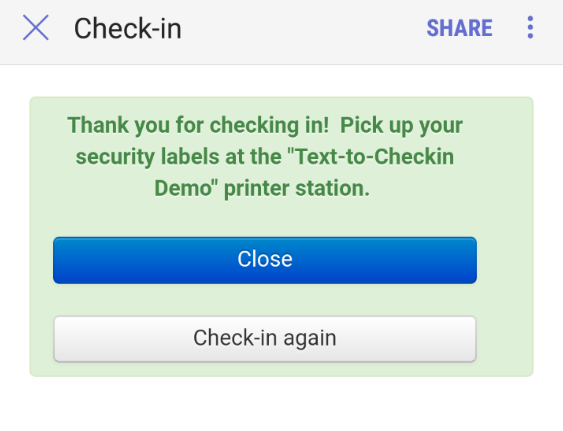 For the keyword to work, you need to start a check-in session so that at least one printer station is active. 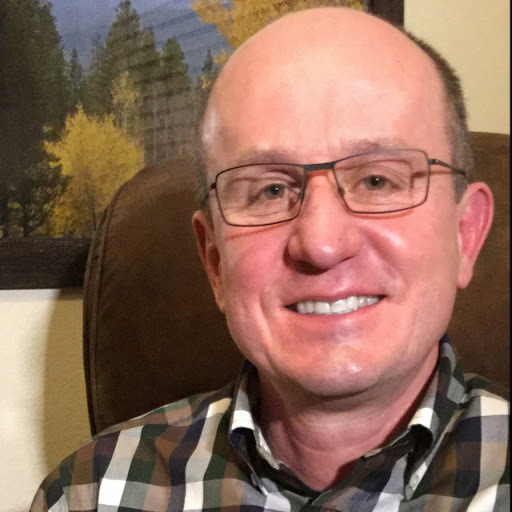 (If you are unsure about the difference between a check-in station and a printer station, join me for the check-in virtual class I do every other week or email us for a video link.) If no printer stations are active they will get the following message. 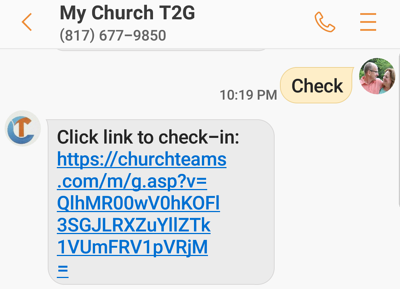 If you do not need to print labels, for instance, using check-in for a youth group where you just want attendance, Text-to-Attend not Text-to-check-in is the best, most streamlined way to go. Once they click the link, they will choose which label printer to use if you have more than one active. (Be sure to name printer stations so that they are easily recognizable.) If there is only one printer station it will be used automatically without a prompt. First time use for regular attenders. 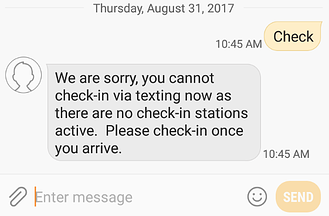 If a person has already used Text-to-Give or Text-to-Register they will be in the system. So, it will take them to their family page for check-in. If not, the software uses their phone number to find them in the database and prompts them to confirm their identity. Family Check-in page. Once regular attenders click the link to check-in, they will be taken to their family page which has been optimized for use on their phone. 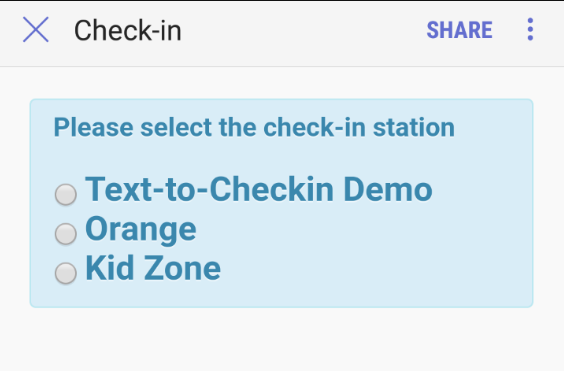 Some check-in view options that don't make sense in this use case are removed. These include: Add New Family, View Profile page, Remove from a class, and text the parent. But, everything else is controlled in the check-in view as normal. 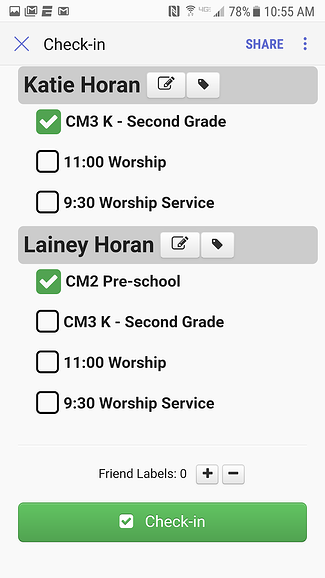 In this screen shot you see the Edit option for the member is enabled (gray edit button next to the name) and the Name Tag label next to it. When they click the Name Tag label or the green Check-in button, all tags will be printed by the label printer they selected above. After checking in they will see the following page and have the option to check-in again. 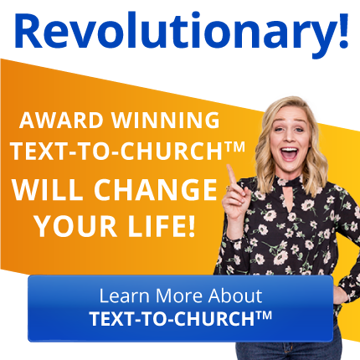 The Close button will take them to your church's website. 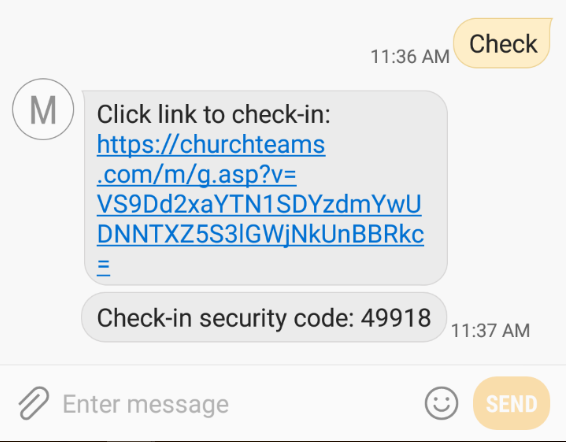 Parent Security code is texted to them. 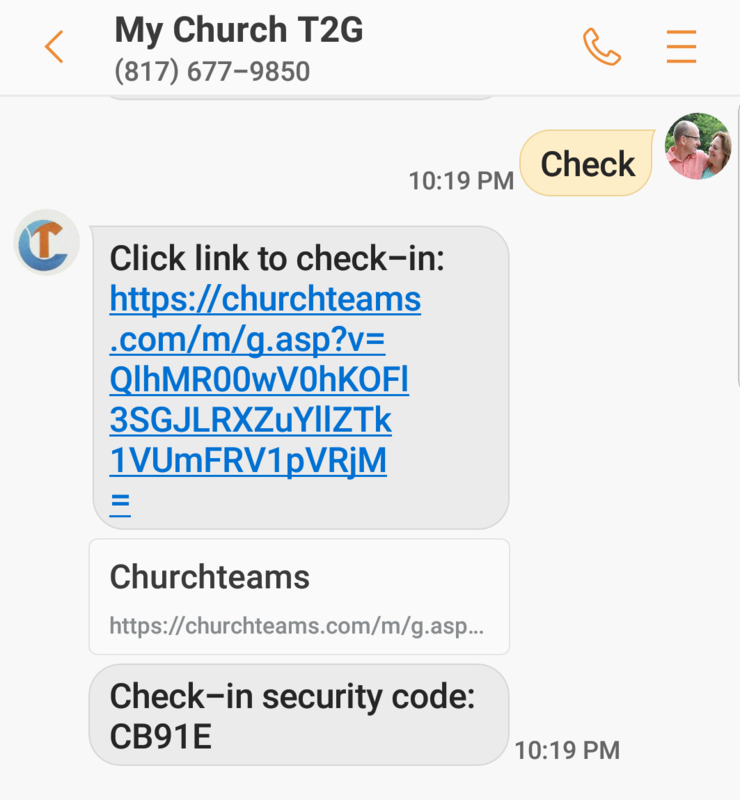 If Family Labels (Option C1 in the check-in view and our recommended option) are used, then the parent security code can be texted back to the phone as shown below. If option C2 is used where they print each child out separately the security code will not be texted for those as each child would have a different one unlike C1 where it's the same code for each child. If you aren't using our Online Giving / Text-to-Give, you will need to enable those to take advantage of this feature. You can do this anytime under Setting / Contributions / Online Giving. 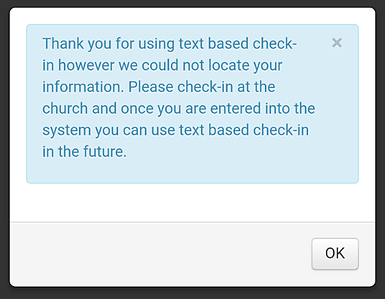 We feel like text-to-check-in will be a game changer for the use of texting in church. As your regular attenders get used to using it, they will find it much more convenient than checking in at a kiosk or downloading an app. They will also be so grateful that they can just focus on their kids on Sunday morning and not have to stress about waiting in some line to get security tags. And, in that way, you have served them well.